LTE – Loooong Term Evolution? LTE (the GSMA-adopted roadmap to 4G for GSM/UMTS carriers) has been getting a lot of attention of late. Verizon Wireless plans to begin network deployment in 2009 (using their newly acquired 700MHz spectrum) with full network deployment in 2010 and beyond. AT&T has also announced LTE rollout plans in 2012. Vodafone is also making the obligatory statements about rollout plans in 2011-2012 time frame – its ex-CEO, Arun Sarin has made snarky comments about Verizon needing LTE more than Vodafone owing to the inability of EV-DO to scale up to near-4G speeds like HSPA. No marked difference in spectral efficiency – LTE proponents talk about 144Mbps Downlink (DL) and 50+Mbps Uplink (UL) speeds. But realization of these speeds require available spectrum in excess of 20 Mhz. Now probably is not a good time to be buying spectrum. As the chart shows (courtesy: Qualcomm), spectral efficiency of HSPA+ (when MIMO is included) is close to that of LTE when you consider 5Mhz spectrum. 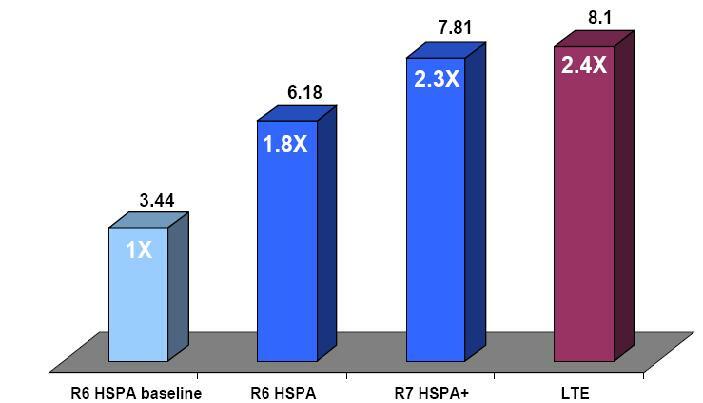 Significant less Investment in Infrastructure – It is much easier and less expensive to upgrade HSPA to HSPA+ given that LTE is based on OFDM – a completely new modulation scheme while HSPA+ is still based on W-CDMA. LTE needs a completely new set of radio access and core infrastructure components – not only are the radio access algorithms different, the signaling and control protocols from the access to the core are also significantly different. Backward compatibility – It is simpler for a HSPA+ subscriber to gracefully handover to a HSPA network – the connectivity between RNC and the core (SGSN and GGSN) remains as before. Significant complexity exists for handover to be implemented between 4G/LTE and HSPA+ networks. Handset and terminal availability – Availability of LTE handsets may be less of an issue – clearly, the initial application for both HSPA+ as well as LTE is in mobile broadband (with USB dongles). It is reasonable to expect that HSPA+ dongles will be cheaper than those supporting LTE – given that a new semiconductor ecosystem needs to emerge that supports LTE.